Home > Heavy Duty V Belts > Moulded Notch V-Belts. AX, BX, CX, 3VX and 5VX Sections. > AX Series. 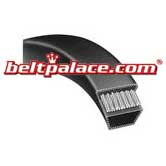 1/2" Wide Molded Notch V-Belts > AX21 Classical V-Belt, Consumer Brand. > A21 Classical V-Belt > 4L230 FHP V-Belt. Consumer Brand. 4L230 FHP V-Belt. Consumer Brand. 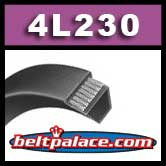 4L230 FHP V-Belt. 1/2” W x 23" Overall Length. Consumer Brand. GATES 2230/4L230 Truflex V Belts. Classical A21 V Belt on light duty applications. A21 Industrial V-Belt, Consumer Brand. 1/2” Wide x 23” Length OC (13mm W x 584mm L OC). Features polyester cord reinforced, superior compression section for high temperature and load carrying performance. Static, Heat, and Oil resistant. High quality for low cost! NAPA, Grainger, Ametric (low grade) A21.